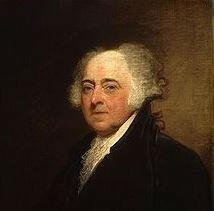 John Adams followed Washington's lead in using the presidency to exemplify republican values and civic virtue; and his service was free of scandal. He continued to strengthen the central government by expanding the Navy and Army. In July 1798 Adams signed into law the Act for the Relief of Sick and Disabled Seamen, which authorized the establishment of a government-operated marine hospital service.